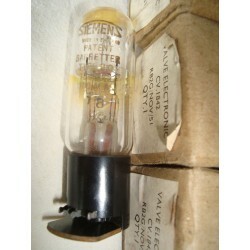 Top quality audio miniature glass triode pentode tubes manufactured by RCA. With these beautiful 9 pin double section tubes, the triode section may be used may be used as AF amplifier, and the pentode section as output amplifier. They come with tall gray plates, top halo getter, and are glass etched 6BM8 ECL82. They are also printed in red with new style RCA logo and 1967 production codes. Boxes are standard RCA red printed Hecho in Mexico 6BM8.